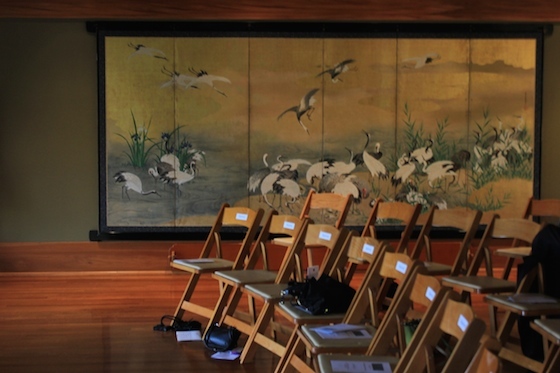 November 6, 2014, 2:55 PM · Five centuries converged right before my eyes -- and ears -- at an extraordinary house concert I had the honor of attending a few weeks ago in Pasadena, Calif.
My good friend, David Scheidemantle, gave a benefit recital for the Los Angeles Children's Chorus (an excellent group in which my son sang for several years) which featured seven violins ranging in year from 1610 to 2014 and in origin from Italy to the U.S. He was joined by his daughter Kaela, also a violinist, pianist David Dunford, and oboist Michael Bernard. Luthier Georg Eittinger of Hans Weisshaar Fine Violins and Bows also spoke about each violin. First was the beautiful setting, the historic 1913 James Allen Freeman house, on a perfect-weather autumn evening in Southern California. 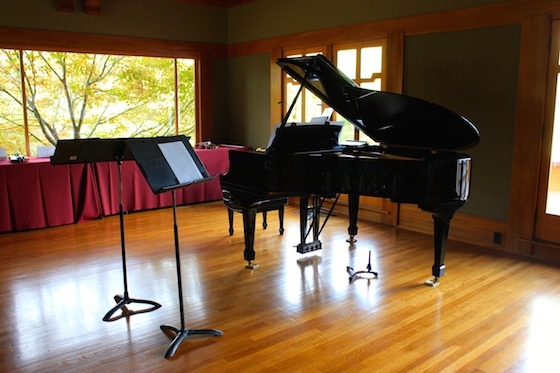 The recital took place in a room that had been specially designed for chamber music, David said. In fact, he said he was enjoying the acoustics so much that it reminded him of the fiddle trial room at Bein and Fushi that they refer to as the "Ego Room" -- because everything sounds so good in there! 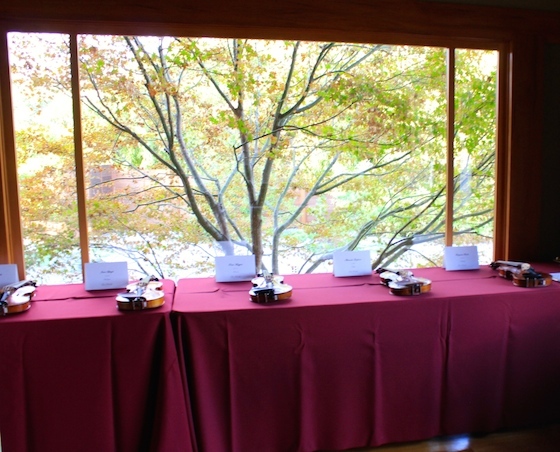 The seven violins representing five centuries were lined on a long table by the window. They included a Paolo Maggini (Brescia, c. 1610); Goffredo Cappa (Saluzzo-Turin, 1690); Hendrik Jacobs (Amsterdam, 1699); Alessandro Gagliano (Naples, 1709); Benjamin Banks (Salisbury, c. 1775); Janos Spiegel (Budapest, 1918) and a just-made, varnish-barely-dried Georg Eittinger (Los Angeles, 2014). About 50 people gathered for the recital, which included works by Corelli, Bach, Brahms and John Williams. First David and his daughter played Corelli's Trio Sonata Op. 4 in A minor -- David playing Georg Eittinger's 2014 violin and Kaela playing the 1690 Cappa. "I thought the contrast between the age of the instruments was a good reflection of the contrast in age between father and daughter!" David joked. More compelling to me than the contrast was the ease with which those instruments -- and musicians -- sang together. To be sure, the older instrument had its mellow tone and the new one was a bit brighter, but in Corelli those voices weaved in and out just beautifully, old intertwined with new. And it was fun for me to see Kaela, 17, once a three-year-old in the Suzuki group class where her mother and I teach together, now a mature musician -- there's another bit of time travel for me! By the way, the violin that David was playing was only completed weeks ago -- "I worried that the varnish would be dry enough!" Eittinger, its maker, said. 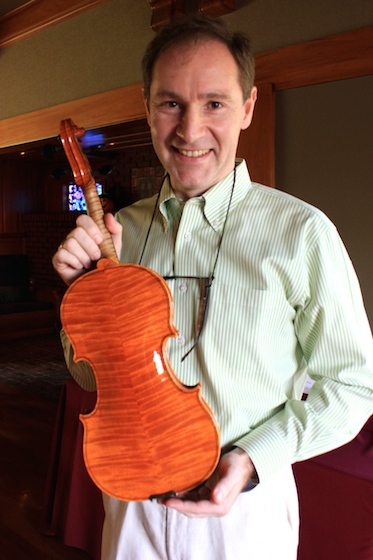 Eittinger said that it takes him about 200 hours to make a violin in the white, with a few more hours for the varnish. This particular violin was made of flamed maple for the back and scroll and spruce for the front. "It still has that new car smell!" David said. The next instrument was a 1699 Hendrik Jacobs (1639 – 1704), made in Amsterdam. The violin was based on an Amati, not a Strad pattern, as was the custom in Holland. It's a smaller pattern, with a more pitched arch. The varnish is transparent, with a deep color. Because Jacobs was a contemporary of Dutch painters such as Vermeer and Rembrandt, his aptitude for varnish often gets associated with those artists, though there is no widely acknowledged evidence of a direct connection. David and oboist Michael Bernard played Bach's Concerto for Violin, Oboe and keyboard in C minor. For the Brahms Violin Sonata in D minor, David played each movement with a different violin: a 1918 János Spiegel for the first movement, a 1610 Paolo Maggini for the second, and his own 1709 Allesandro Gagliano for the last. I'm afraid I lost all sense of attention upon hearing the Maggini, though -- a violin "from the beginning of violin-making," as Eittinger described it. Never mind that the maker's name sounds to me like a cross between "magic" and "genie," or that the back of it has some of the most elegant decorative purfling I've seen in person -- this violin had a special sound. Something in its sweet tone, smooth voice and easy partnership with David captivated me. The violin was made in Brescia, one of the earliest places in Italy to be known for violin-making, where Maggini was a student of one of the earliest violin makers, Gasparo da Salò. This violin, in this living room, from 1610, to 2014. After the recital was over, and after everyone had retired to the patio for the reception, I found my way back into that living room. With permission from David and Georg, I tried playing the Maggini. It was everything I suspected and more. I was just playing "Meditation from Thais" and some Bach, but I really didn't want to stop. Isn't a violin a strange thing? It has its own voice, yet hundreds of violinists over a period of 400 years can sing with it. It can stand alone as an object of great artistry, value and historical worth. But paired with a musician to play it, the object of art takes on the dimension of the living, breathing being. That really is magic. November 7, 2014 at 01:55 AM · I only played a Maggini once before, and this was back in the 80s when I was helping a friend try new instruments. (At $90,000-- or maybe "only" $40,000-- even then, Magginis were not in his budget. But we got a sweet treat at the end of our morning.) It was incredibly easy to play and had a sound that just poured out like melted chocolate. Almost everything on it sounded dark, and for that reason, it was probably a little too one-dimensional to be an everyday choice. Still, its best qualities were hard to miss! Oh, and I bet an instrument like that would have hit the cover off the ball in the Brahms's second movement! November 7, 2014 at 06:41 PM · I wish you had recorded that recital.